One question people often ask me is what 3G or 4G broadband is like in rural areas, such as for downloading, streaming or gaming. Unfortunately, the areas with the slowest fixed line services tend to also have the most congested 3G/4G cell towers. This is due to other people turning to mobile broadband in a hope of getting faster Internet access. I live in an area outside Kilcar (Co. Donegal) with many houses that get less than 5Mbps on DSL. Many houses here are not even on the Open Eir rollout map for FTTH. The only 4G service available here is from Three, so just how does it compare with DSL? How does Meteor 3G and Vodafone 3G compare to the supposedly superior 4G service that Three offers? When I telework from home, I often need to upload large files to my workplace. These files are typically around 50MB, but occasionally I need to upload a 500MB or larger video file. My 5Mb DSL connection only has a 512kbps uplink. With a typical sustained upload speed of about 50KB/s, a 500MB file would take about 3 hours to upload. Meteor was the first network to provide 3G here mid-2015. Straight away I purchased a dongle and Meteor SIM. Unfortunately, while the signal and speed was great in the village, I could not get a signal at home. I then purchased a cheap desktop antenna from eBay. With the antenna temporarily placed outside an upstairs skylight, I got 1-2 bar (out of 5) signal and a usable connection. Knowing that I could get a usable signal, I purchased a second-hand Huawei B593s-22 router and went through several antennas over the following months. One big mistake I did was purchase a rather expensive 1.8-2.7GHz MIMO antenna, not realising that Irish cellular providers started operating on the 900MHz band for 3G, as what happened in Kilcar. With the right directional antenna, I get a 4-5 bar 3G signal on Meteor. Early 2016, back when I still used Three for my mobile service, I noticed my phone had a strong 3G signal going through Kilcar. A month later, I started getting 4G with Three. I ordered a prepay Three SIM card and gave it a test run. During the daytime, its speed felt like my workplace’s VDSL connection. With fine tuning of the outdoor antenna, I was hitting 53Mbps on the downlink. This fell to 44Mbps a few months later. Evening time speeds were decent, so I used it to supplement my DSL connection. The DSL still had the advantage of being consistent, such as for streaming. Three’s 4G was brilliant for sending large files to work. The same 500MB file would take about 5 minutes to upload, instead of 3 hours by DSL! By the end of 2016, Three’s 4G performance severely nose-dived in the evening. It came to the point where it only performed well up to 5-6pm. I also gave iD Mobile broadband a test run, but it performed similar to Three – great during the day and a snail’s pace by night. At that stage, I turned back to Meteor. Coincidentally, Meteor started offering the 50GB prepay bundle and surprisingly its performance remained consistent since it first went live in Kilcar. While Meteor performed great with both 3G and 4G on my mobile phone, I still had issues that lead to me switching to Vodafone. There were some areas such as Barnesmore that I could only get 2G coverage. Some areas such as Carrick did not even have a Meteor signal. My speed was intermittently getting capped at 300kbps on my mobile until I toggled airplane mode, an issue I didn’t have with any other network. When I tried Vodafone, I could finally listen to Internet radio for 90+% of my hour journey to work. With Meteor, the station cut out so often than TuneIn would quit playing. With my mobile on Vodafone, mobile broadband on Meteor and a prepay Three SIM I had from previous use, I thought this would make a great opportunity to compare all three. I purchased a 500MB add-on with Three as I had no intention of using it beyond this test-run. I then carried out a series of tests with all three networks, along with my 5Mb DSL connection to compare with. While I tested Three in both 3G and 4G mode, I chose just the 4G screen recordings for the video. The following table shows the page loading times. This includes Three 3G, which I left out of the video. Time until the main content appears, ignoring ads. Includes scrolling down until the entire page finishes loading. Time until the first banner fully displays. 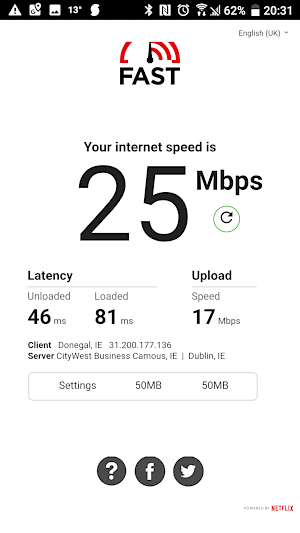 Except for the Eir website, the Three 4G connection did well. For general browsing, the Three 4G performs best with websites with lots of small images, such as the Independent. Larger images take longer to open than other connections, as demonstrated by the Eir website. 4G may seem like a great way to accelerate file downloads. However, as shown by the video and table below, this is clearly not the case with the Three network. I chose Heanet as they are based in Ireland, have a 10Gbps backbone and rarely does their bandwidth utilisation exceed 10% of that. Unlike browsing, Three’s traffic shaping appears to severely throttle file downloads, at least in this area. Interestingly, file downloads were roughly 4 times faster over Three in 3G mode despite much longer page load times. I repeated this test with other file downloads and got similar download speeds. My Meteor 3G connection downloads roughly 30 times faster than Three 4G during the evening. During the day, Three performs a lot better over 4G, delivering VDSL-like browsing performance and download speeds around 1MB/s. As Three appears to limit throughput per connection, faster speeds can are possible with a multi-threaded download manager, such as the DownThemAll! Firefox add-on. The maximum speed I can achieve over Three 4G with my setup is 5.5MB/s (44Mbps), usually very early in the morning. Meteor’s speed is generally consistent and I often hit 1.5MB/s regardless of the time. I did very little testing with Vodafone, mainly due to their frugal data offerings. With the poor ECIO signal readings, my Vodafone speed appears to be crippled due to interference more so than contention. The following table shows the maximum YouTube resolution I could reliably stream with each network. All networks have no problem streaming YouTube generally. The reason Three and Vodafone kept buffering in my video was due to forcing Full HD (1080p) playback. Most users streaming YouTube on a mobile phone will unlikely notice the lower resolutions. In fact, 480p is the equivalent to broadcast quality standard definition, such as watching TV3 and TG4 on Saorview. YouTube seems to have also reduced its Full HD (1080p) bitrate over the past year. Just over a year ago, the maximum resolution I could reliably stream over my 5Mb DSL connection was 720p. From what I recall, 1080p videos were encoded at around 5-6Mbps. Now, most 1080p videos on YouTube appear to be encoded around 3-3.5Mbps. These reliably stream over my DSL connection as long as there is nothing else using the Internet. Higher frame rate YouTube videos are encoded at a slightly higher bitrate, usually around 4-4.5Mbps for a 1080p 50FPS video and 4.5-5Mbps for a 60FPS video. Such videos reliably stream over my Meteor 3G connection. I have not tested any 4K videos over Meteor, mainly due to the intense data consumption. With the Three 4G network, the maximum resolution I could reliably stream at during the evening varies between 240p and 480p. Surprisingly as with file downloads, Three 3G fares better and was able to reliably stream at 720p with a few tests. During the daytime, Three 4G has no problem streaming 1080p even at 60FPS. Gaming and voice calls require ping times and packet loss to be as low as possible. For example, satellite broadband is unsuitable for gaming due to its very high latency. High ping times and spikes lead to “rubber banding” with online gaming games, such as random/jerky player movement. With voice calls, data needs to travel in real time. Erratic ping times and packet loss can result in robotic sounding audio. Ping time spikes and excessive packet loss can lead to audio drop-outs or garbling. The following graph shows the minimum and average ping times in milliseconds. The ping test was carried out over a period of roughly 20 minutes, 1000 pings per test. The evening tests were carried out around 9pm to 11pm. The morning tests were carried around 10am to 12pm. Despite the severe congestion on Three 4G, it manages to keep the ping times reasonably low in the evening. They are not far off my DSL connection, which are high due to interleaving on the connection. The 3G ping times are quite similar across the providers despite the large speed variations also. Now let’s look at the packet loss recorded from the above tests. With 1000 pings per test, each packet lost accounts for 0.1%. I repeated this test a day later and got similar day and evening results with Three 4G. Surprisingly, Three’s 3G service was the only connection that managed to provide zero packet loss in the evening. However, its high and erratic 3G ping times still leaves it undesirable for gaming and jitter-sensitive applications. Both Meteor 3G and Vodafone 3G are adequate for video and voice connections such as VoIP and Skype video calls. Surprisingly, both manage to provide similar day and evening performance. I have made VoIP calls using Blueface over Meteor, which were fine. Three 4G on the either hand delivered robotic broken audio with an evening time test call. There is also a substantial improvement in the uplink capacity serving this area (Kilcar) as the following screenshot shows from a YouTube clip at 9:30pm. Previously YouTube had to drop as low as 240p to reliably play between 8pm and 10pm. With Eir’s FTTH recently going live in the area, it is also possible that there were several users with intensive Three 4G usage that have since switched to Fibre. Despite Three’s upgrade works here, there are many areas with severe contention such as this example posted on Boards. I strongly recommend doing a trial run with a prepay Three SIM before signing any contract. Three upgraded the mast in Kilcar, which led to another substantial speed improvement. Following the earlier upgrade, I ceased my DSL connection and ported my landline to Goldfish VoIP. The improvement is particularly noticeable in single thread speed tests and downloads. Multithread speed tests such as Ookla are roughly double that of leading up to this day for similar test times. As coverage and congestion varies from one area to another, I strongly recommend testing all three networks with prepay SIMs. For example, while Three 4G evening time performance is abysmal in this area, it performs better in areas particularly where the 1800MHz band is in use, delivering double the bandwidth. See this article for advice on the largest prepay and bill pay bundles available on each network. Update 26th July 2017: Added a section on ping tests and packet loss. Update 22nd September 2017: Added an update on Three. They fixed the packet loss issue in my area and peak time performance is lot better. Update 7th March 2018: Three upgraded the Kilcar mast. There is a substantial improvement in peak time performance here now. Sean a most enlightening article. On holidays out in N.Z. At the moment and just got the three 750 gb package and speeds are circa 30 mb. Delighted. Have decided to get outdoor aerial with hope of increasing download speed. Listening to all the rubbish recently on NBP confirms how glad I am to have ditched the land line. I have lobbied eir for past three years to redirect our copper wires into an enabled cabinet without success. Thanks again. I’ll probably do a follow up article to this as Three has improved a lot since around September last year. I now get around 10Mbps peak time with about zero packet loss and up to 30Mbps with prioritised services such as YouTube and Microsoft. For example, Windows updates no longer choke the connection like they did with my DSL connection. At this point, I am ready to sign up to a VoIP service and port the landline # across. I’m paying just over €45/month (old Digiweb DSL+anytime calls package), which I’m just using for calls now. In the worst case that Three slows down again, I can use a combination of Three and a prepay Eir SIM, like I did to supplement the DSL connection before Three upgraded our area. I was reading your article at the following link! I am curious to know how three are doing now with regard to d/l, u/l speed, ping, latency etc as of Aug 2018. Those plans above are for Three Broadband One and Three Broadband Two. “3 Unlimited Broadband” clearly states Unlimited‡ only. I would like to hear your thoughts on this matter. Three did upgrade work around our area late last year and improved quite a lot. However, as of around March this year, I get interference from a mast they put up across the bay as I don’t have clear line of sight with the local mast. This knocked out my connection until I got hold of a directional antenna with a narrow acceptance angle. However, I no longer get a Three signal on my phone even standing outside. I may do another follow-up video later, although I no longer have DSL to compare with. I typically get around 20Mbps to 30Mbps on Three throughout the day and drops to around 10 to 20Mbps in the evening. The upload speed is typically around 12Mbps. These speeds mean nothing for other areas as it will heavily depend on factors such as the number of people actively using the mast, the uplink capacity to the mast (especially if microwave fed) and other factors such as interference, line of sight, etc. 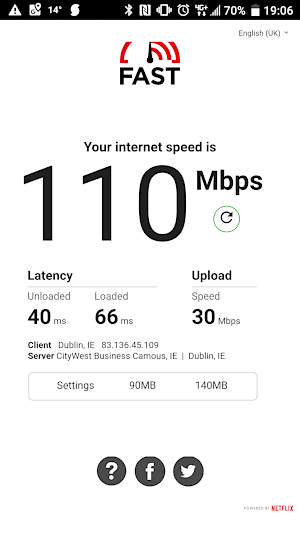 I was surprised to even get 110Mbps this evening in Donegal. Two years ago, Three’s speed rarely exceeded 10Mbps in Donegal town after 6pm, especially on a weekend, giving an idea of their upgrade work. As far as I can tell, Three only do the ‘Unlimited’ plan despite the price being shown as €29.99. I originally signed up back when it was titled “Broadband Two”, with “30GB / 750GB^” shown on the “Choose your plan” page. Even in my online billing it shows I’m on the “30480MB” package. However, Three stated that the 750GB will last the full length of my contract, so I will need to keep an eye on My3 once the contract ends around July 2019.